Ten cylinders, 610 kW (830 hp) at 2200 rpm - no, this is not the data of a Formula 1 engine. These is the data of the 4540 kg 90°-V, four-stroke multi-fuel pre-chamber engine of the Leopard 1 main battle tank with the type designation MB 838 CaM-500, produced by MTU. But the sonorous sound and the power of this engine is not too shy a comparison with a Formula 1 engine. This powerpack - combined with transmission and cooling system in one block - was installed in all the Leopard 1 variants and off-shoots and has proven its reliability impressively around the world and under various conditions. The combination of engine, transmission and cooling system was unique until then. In conjunction with quick disconnect couplings of pipes, tubes and shafts, the concept allowed a complete engine change by an experienced crew in about 15-20 minutes. Even in Formula 1 this is not possible! The engine compartment was an integral part of the overall concept. The mounting points and the fuel system, brake system, end plates and air filter system were designed so that a faster replacement or repair could be guaranteed. To this day, the concept of a complete powerpack in the construction of main battle tanks of all nations is the ideal. 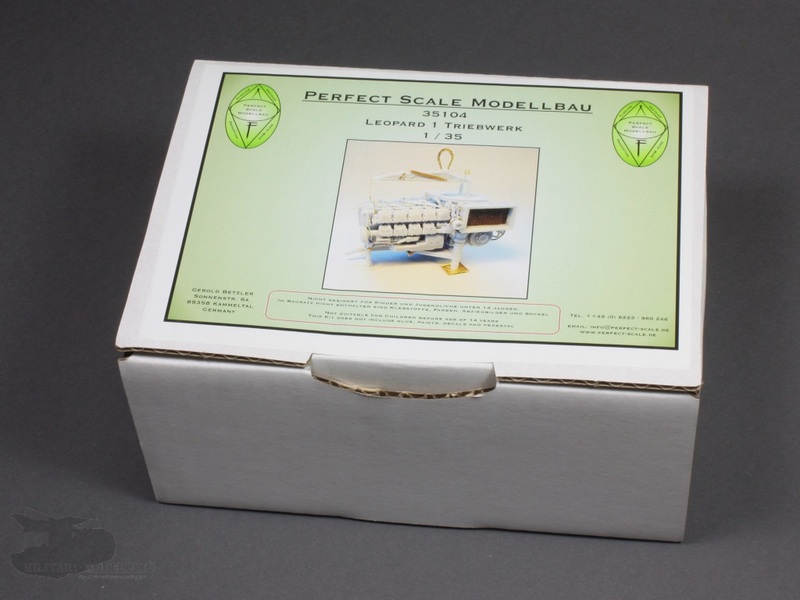 Perfect Scale Modellbau, known for its diverse resin series, has much for Leopard 1 fans in their portfolio. 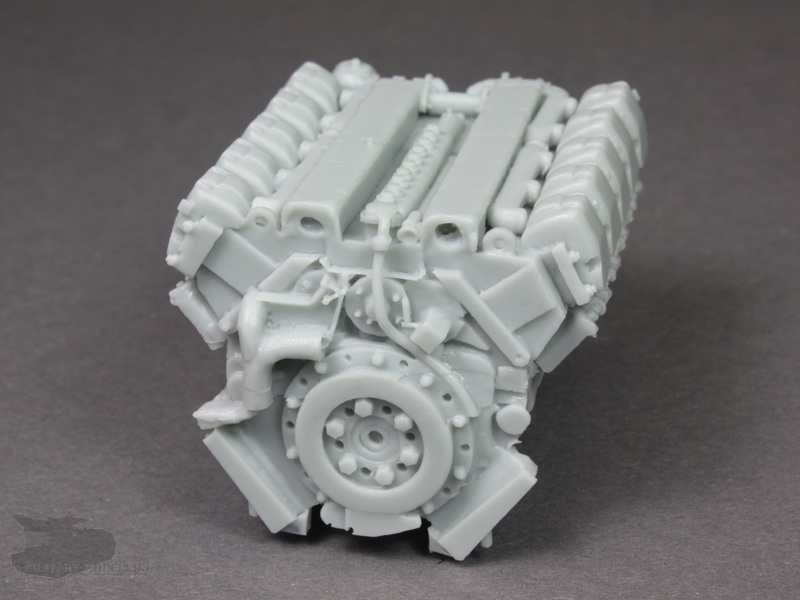 Now, the Leopard 1~s MB 838 CaM-500 engine is available there. The powerpack in 1:35 scale is available in three versions: as a stand-alone engine under item no. 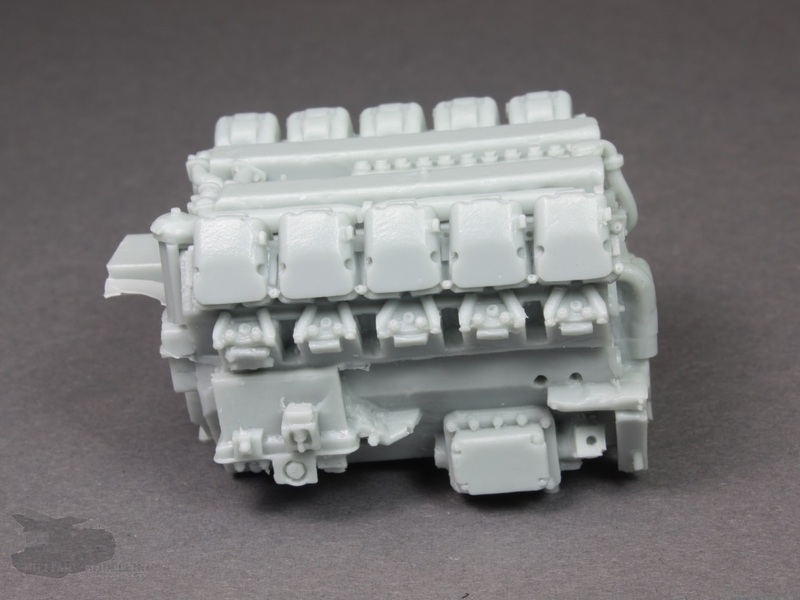 35104, as a separate engine compartment set for the Leopard 1 (item no. 35105), or as a combined set under item no. 35025. It should be noted that the complete set is more attractively priced than the individual sets. For a long time the powerpack was my object of desire and it is time to see what awaits us here. The kit is delivered in PSM's solidly packaged sturdy cardboard boxes. The resin parts and the two photo-etch frets are ziplock-bagged. 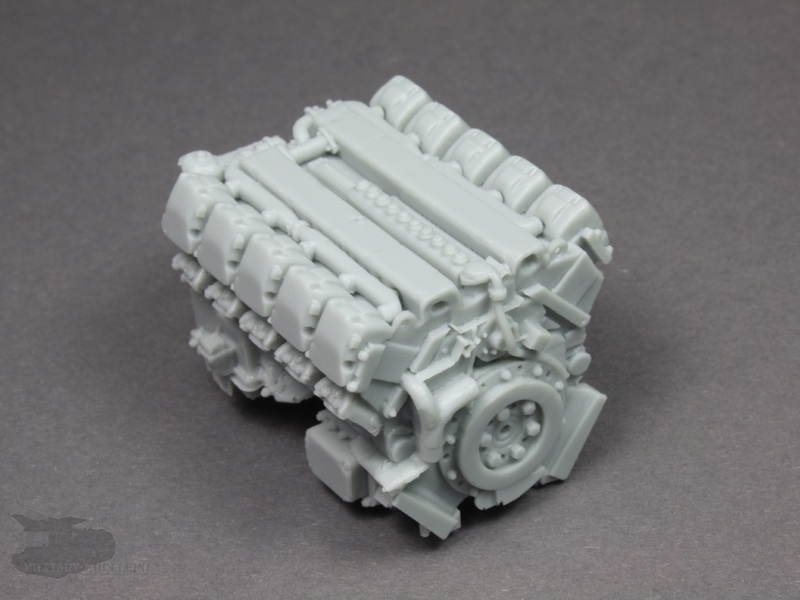 After opening the box, the 53 grey resin parts give a good impression of the level of detailing and casting that has been acheived. 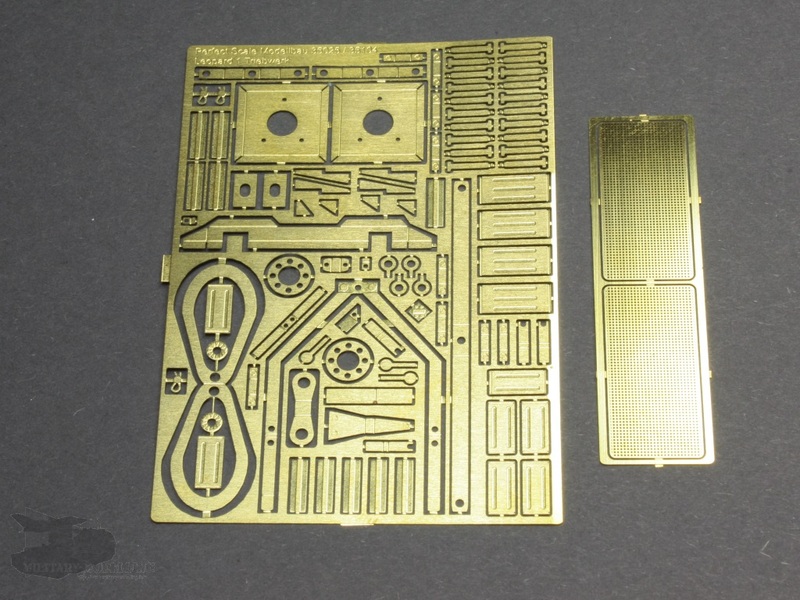 The PE-parts are very finely etched. Essentially, the kit can be divided into three modules: the engine block consisting of engine block and transmission, lifting chains, as well as a powerpack stand. With the lifting frame, the complete powerpack can be lifted out by an armoured recovery vehicle from the main battle tank. Stored on the powerpack stand, it is possible by means of hoses and lines, as well as their quick couplers, to take out the powerpack and connect it to the engine compartment in the main battle tank for testing and maintenance operations. The instructions have four pages. 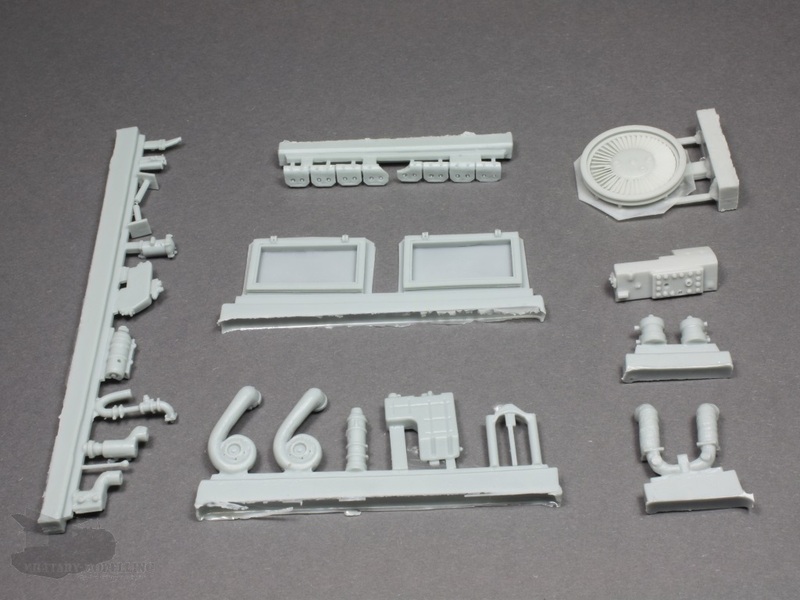 Included are pictures of the components, both in colour and in black and white. All parts are numbered. 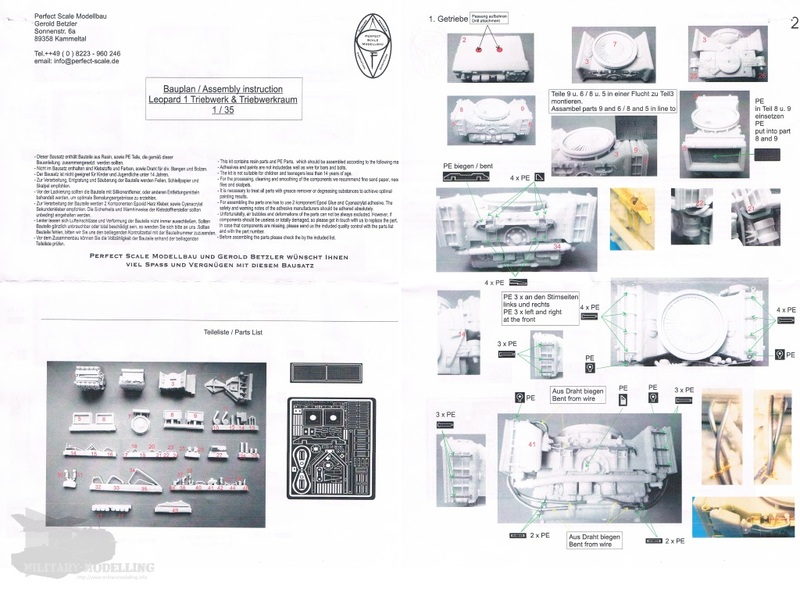 The images combined with instructions will help with assembly. The detailing of the images is good, but they could be a bit larger. Here I have to highly recommend that you provide yourself with additional reference material to ensure and to verify the exact placement of the components. Of advantage are the different views of the components which make it easier for the inexperienced modeller to assemble the parts. A tip from me: the pictures of the fully-assembled powerpack on the PSM website will help perfectly for proper positioning of pipes and hoses. 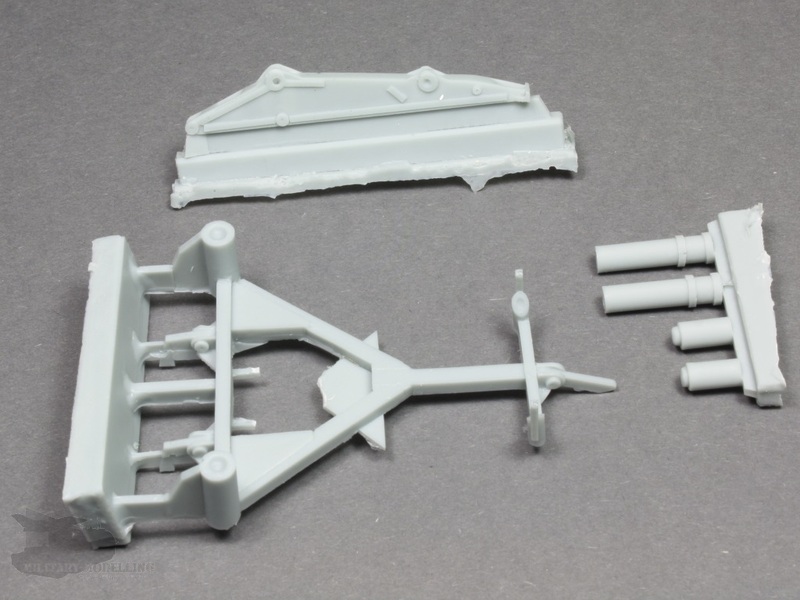 As already mentioned, included in the kit are the engine block, the transmission and the cooling system. Assembly starts with the gearbox and cooling system according to the instructions. From the very large components, I am very impressed when it comes to the issue of detailing and casting. For bubbles, you look in vain! 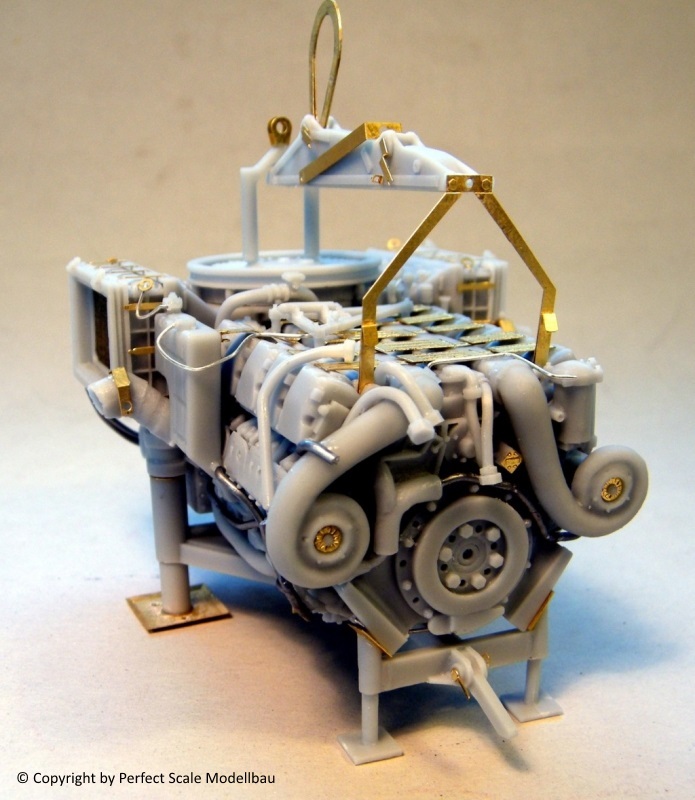 The combination of resin parts and PE parts builds into a very realistic model. 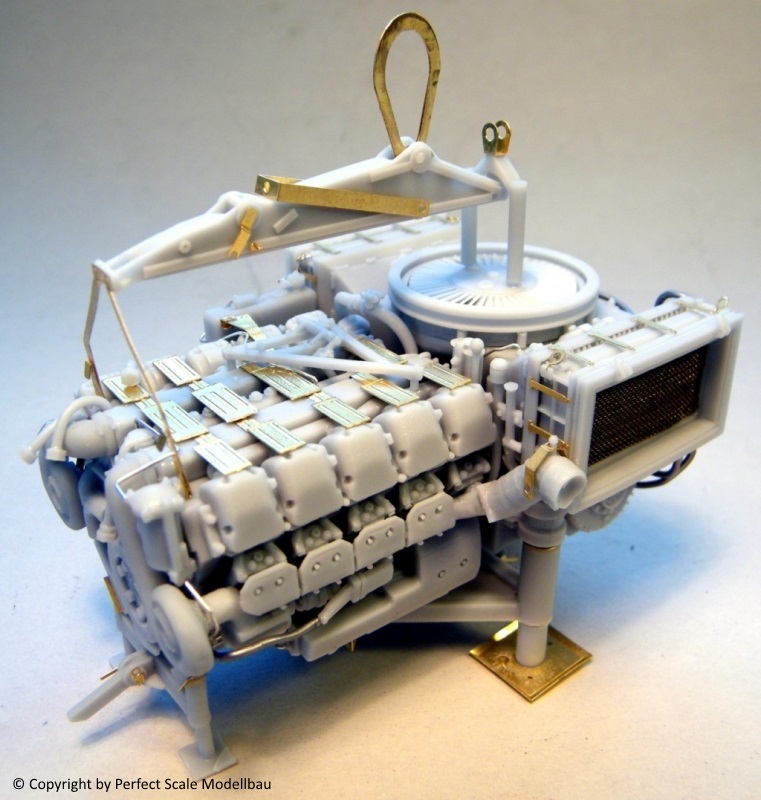 The break down of the components is well thought out and the details of the radiator and the cooling fan are very realistic. Even small parts such as the brake fluid reservoir are presented very well. 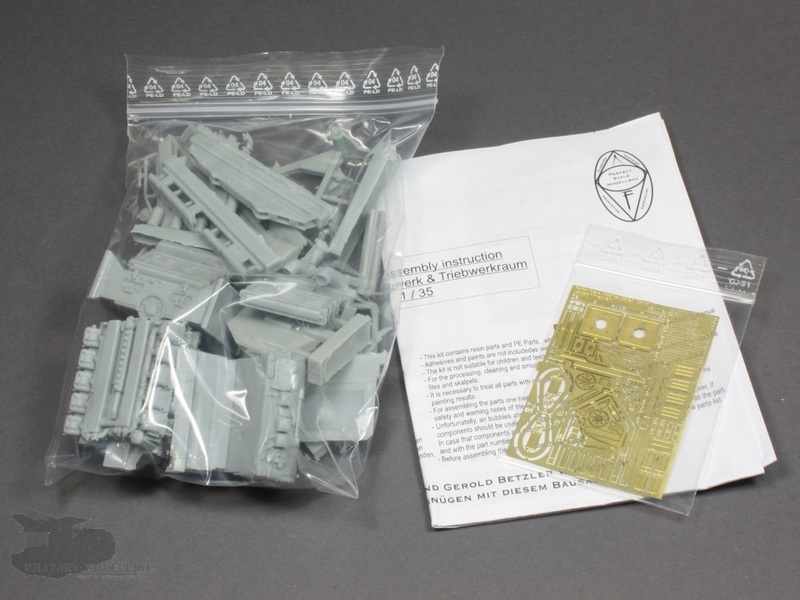 The instructions show further detail here, but some hoses and connecting cables are not included in the kit. 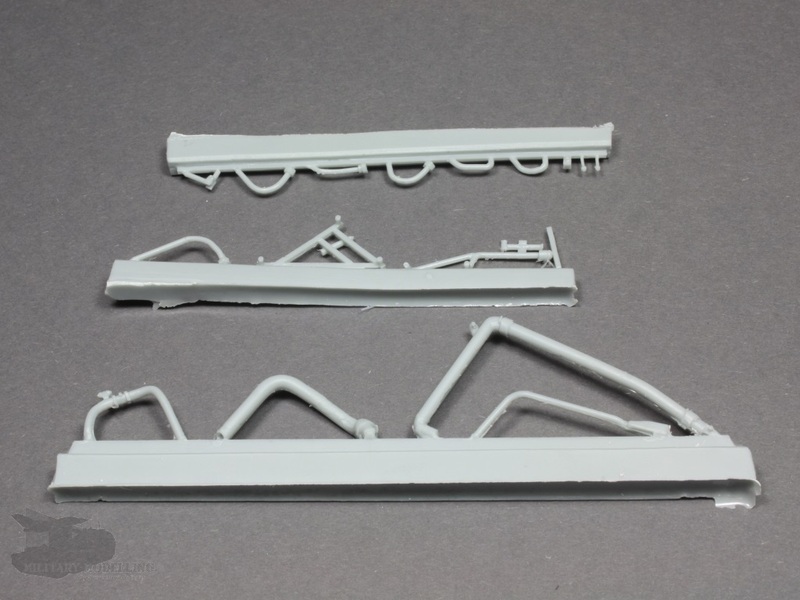 However, wire of various thicknesses should be available to any ambitious modeller. This is where reference study is advised. The next module to be assembled is the engine block itself. The engine block is only a few parts. 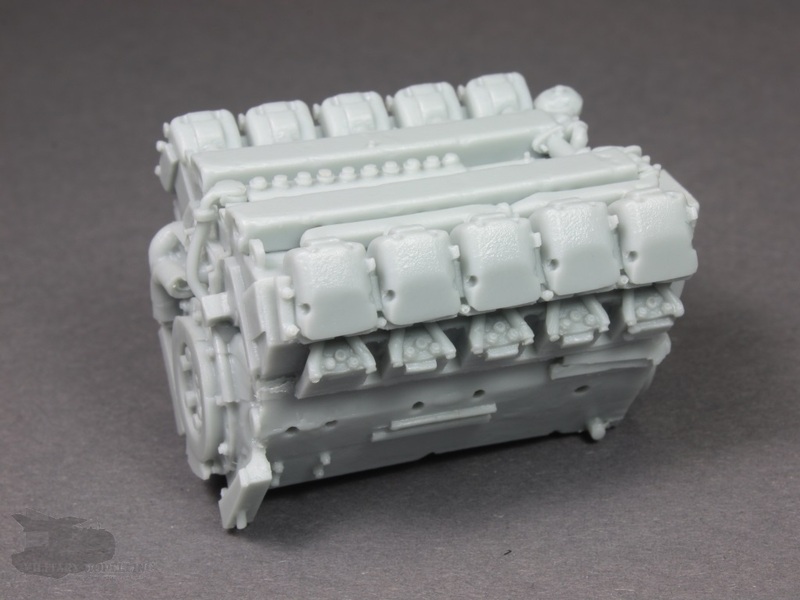 The main engine piece is a very large resin block. Regarding these castings, this is a real gem. The cast is beautifully rendered with sharp details and delicacy. Attached to the main block are the oil reservoir, alternator, air compressors, oil filters, coolant pump, exhaust, control cables, coolant expansion tank, the oil filler tube and dipstick which are fantastically detailed. Photo-etched tread plates make the engine perfect. It is striking that it is not clearly visible in the building instructions how the modules are interconnected. As before, cables and hoses are shown in the instructions which are not included. Lead wire would probably be a sensible alternative. 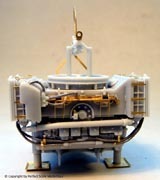 After assembly, what you have is a perfect scale model of the completed powerpack. However, assembly continues with the lifting frame and the powerpack mount. It was a good decision by PSM kit to add these parts, because it allows you to present the powerpack outside the Leopard. The triangular mount consists of just a few parts and is refined with photo-etched parts. Mine was unfortunately broken, but could be repaired easily. Overall, here also is a very well-defined detail that makes it become a little eye-catcher. 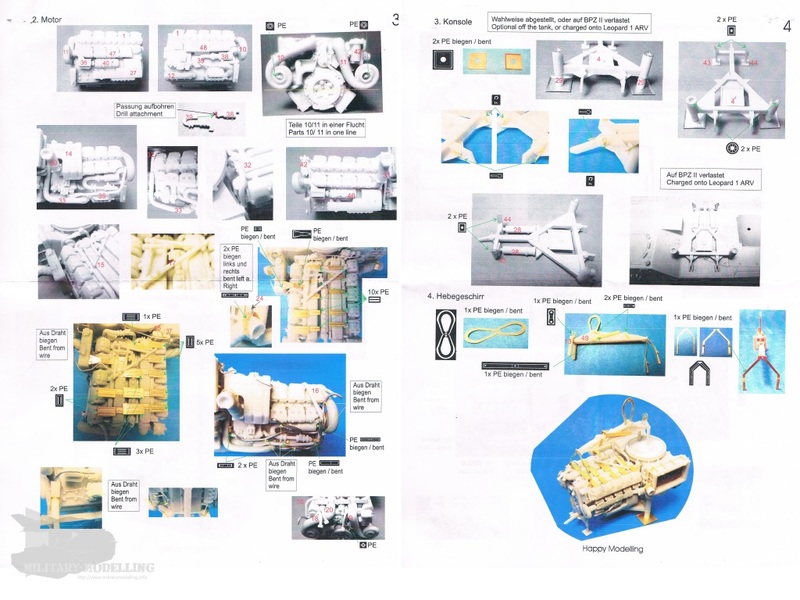 The lifting frame - which is originally part of ARV equipment - consisting of two resin parts and six photo-etched parts. The original contains markings for the maximum lifting weights at the lifting points (500 kg, 2000 kg, 2500 kg and 5000 kg). These markings are missing in the kit and have to be self-created. 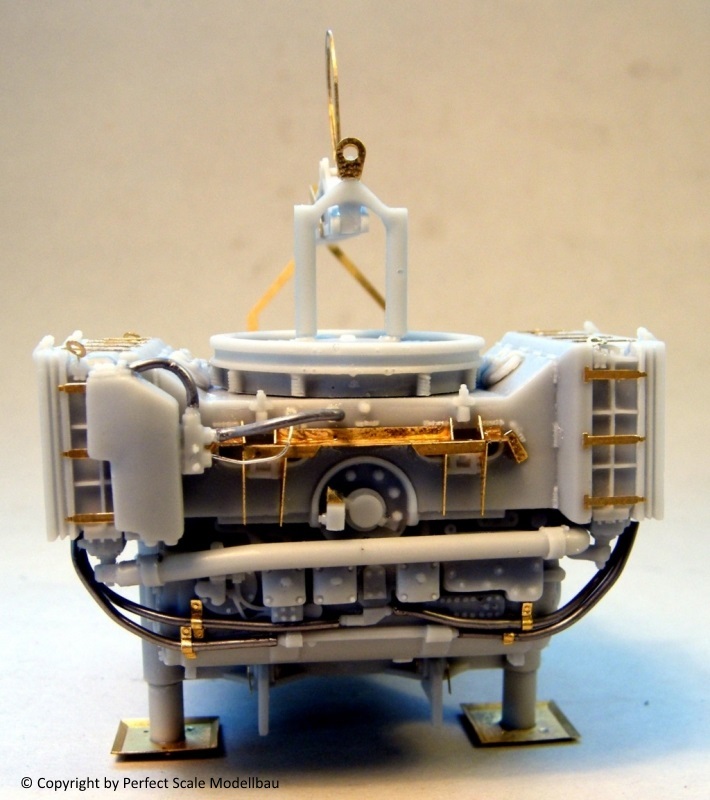 While the attachment point of the lifting frame on the fan is self-explanatory, the other fixing points in the instructions may be confusing for the modeller. Here you had better have to take a look at your references. 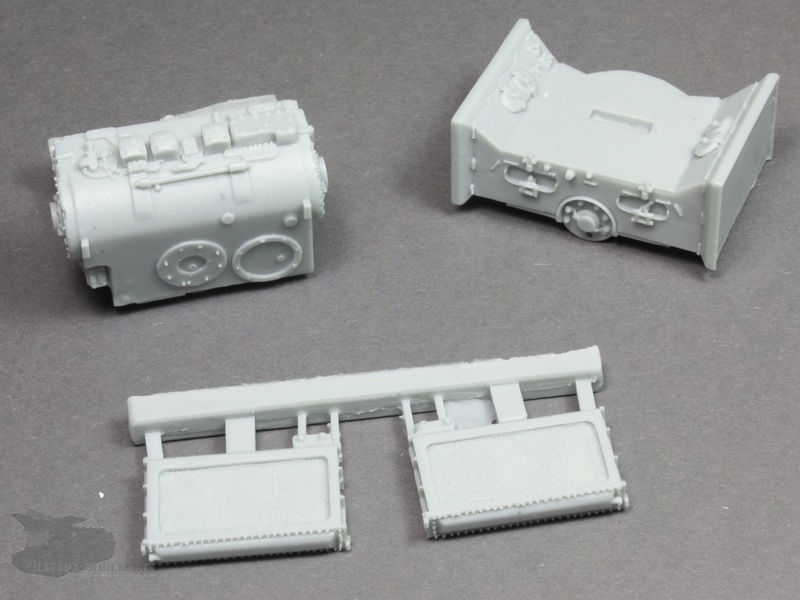 As I have already pointed out, detail-orientated modellers have the option after studying reference material to make the kit even more realistic. These include pipes and hoses, and the drilling of openings such as the turbocharger. Without a doubt, this kit has exceeded my expectations. For a lover of Leopard models, it is a dream. Already out of the box, the details are very well-researched and wonderfully implemented and still leave room for improvement. For beginners, the kit is not recommended. 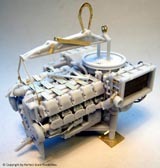 For correct painting, unfortunately, there is no evidence in the instructions and the modeller has to rely on himself. Here it would have been desirable to have painting instructions in the form of images. This multi-component kit is highly recommended and creates a WOW factor in every showcase.